Small stepping stool is great to have when something is just out of reach. 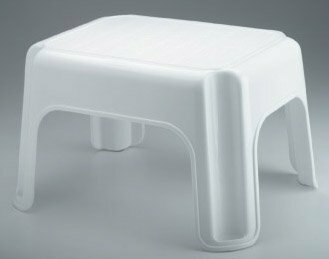 Plastic stool is lightweight but durable and easy to clean. Attractive, skid-resistant surface texture and four skid-resistant feet help keep you stable and safe. Made in the USA. Rubbermaid Step Stool, Small Stool, White, Small (FG420087WHT). Small stepping stool is great to have when something is just out of reach. Plastic stool is lightweight but durable and easy to clean. Attractive, skid-resistant surface texture and four skid-resistant feet help keep you stable and safe.